With the release of the new Necron Codex, the blogging world has been swept up in the darkness of the Necrontyr. It's been a long time coming for these guys and I for one am looking forward to seeing what the new Codex has to offer for these guys both in terms of gaming and maybe even more so in all the new models. This post is a new way of doing the old Collaborative Posts where everyone contributed their content for the rest of us to see at a glance. It will stay up for a few weeks as everyone gets their hands on the new Codex, builds their new armies and discovers the ins and outs of Necrons. All you need to do is leave a comment with a link to your Necron post in it. 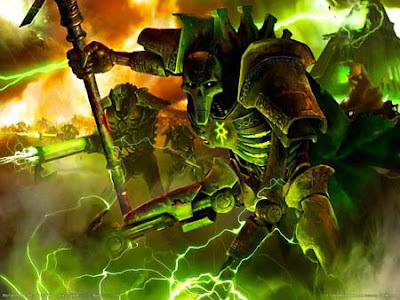 Copy the text from the box, paste it into your comment and replace the text in the coding with the correct information of your Necron related post. Simple as that. Let's see what you've got about Necrons! Path of the Seer: We'll be back! Expect to see a ghost ark WIP tonight when I get back from grabbing one! My life isnot so Epic! : Curiosities about Necrons.